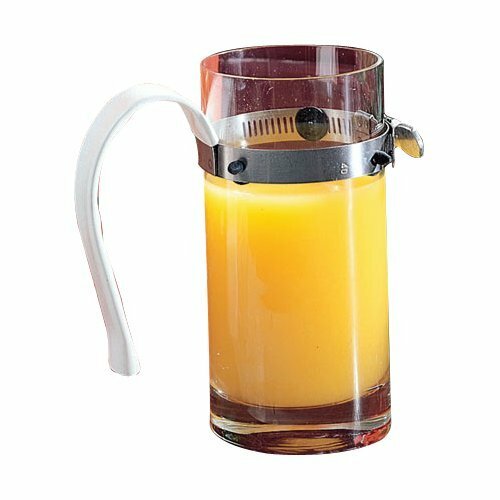 (SEE AVAILABILITY ABOVE FOR ESTIMATED DELIVERY) - Sure - Grip Glass Holder - Sure - Grip Glass Holder - Fastens to a glass to provide a strong, easy - to - grip handle. Can be bent to fit the user"s hand. Plastic coated stainless - steel handle adjusts to all sizes. Dishwasher safe to 145°F. (Glass not included.) Latex free. - Rolyan products are internationally licensed & manufactured for home & clinical use. Most of their products offer a lifetime warranty. The Sure-Grip Glass Holder fastens to a glass to provide a strong, easy-to-grip handle.